If You Find Yourself Guilty Of These Problems, Come Join Us For Our Two-Day Workshop! Have you been just posting at any time? Are you guilty of posting content once in awhile? Or disappearing for long periods of time? Have you been doing your social media without any clear strategy? This event is purposefully capped at 10 students maximum to ensure that each attendee gets exactly what they need to get out of the workshop. 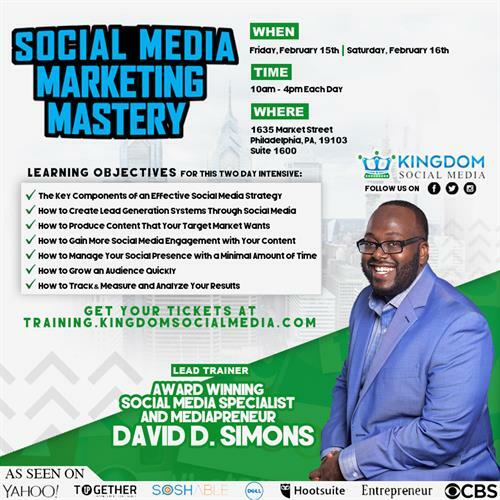 The Social Media Marketing Mastery Workshop is a two-day workshop that helps marketers, entrepreneurs, & professionals to develop a clear strategy, increase revenue through lead generation, improve engagement and build a brand that becomes highly recognized in your ideal target market. We only take serious candidates who are ready to take their social media to the next level! How to measure and track your performance on social media. You will need ID to present to the security guard and once you arrive you will be guided to the 16th floor where the workshop is being held. Lunch will be provided!